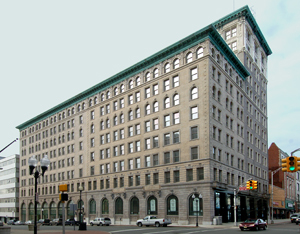 The awards program recognizes rehabilitation projects of excellent quality and the Broad Street Bank building, on State Street in Trenton is on such project. The Broad Street Bank Commissioned William A. Poland, one of the best known men in his profession in this section of the country, to design the City's first sky-scraper, in 1898. The Building was then listed in the NJ and National Registers of Historic Places in 2007. Taking advantage of Federal Historic Preservation Tax Credits this once derelict building has been transformed into 124 light-filled apartments and 12,000 sq. ft. of retail space, including part of the 1900 Banking room and the adjacent Director's Room. It is a significant adaptive re-use within Trenton's historic urban center. THe entire project cost more than $29 million and was completed in 24 months. THis building used energy efficient standards and is LEEDS certified. 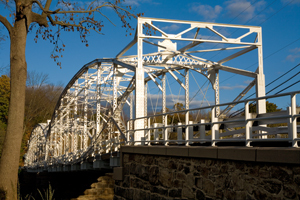 Built in 1896, the Elm Street Bridge is a two span lenticular through truss, and one of the last, if not the last surviving of its type still in service in New Jersey. It was documented by the Historic American Engineering Record (HAER) program in 1983 and determined eligible for listing in the NJ and National Registers of Historic Places in 1995 and contributes to both the Neshanic Mills Historic District in Hillsborough Township and the Neshanic Station Historic District in Branchburg Township. The total project cost for this spectacular bridge rehabilitation was $6,241,000 combining resources from county, state and federal sources. Recognition is extended to Somerset County, both elected and staff, for, not only their sensitivity in executing this project, but for their many years of commitment to incorporating historic preservation into their transportation planning and open space program and in their consistent show of show of deep appreciation for their history. Recognition went to: Claire Sullivan, Matrix New World Engineering, Inc.; John Kendzulak, P.E., Brian Mundhenck, Michael J. Amorosa, David Lorimer, Thomas D’Amico, Somerset County; Michael Seelman, James McGee, Ferreira Construction Co. Inc.; Dan O’Connor, Wel-Fab, Inc.; Richard Grubb, Richard Grubb & Associates; Donald Scott., Jr., Brian W. Maurer, Brian E. Salfelder, Jonathan C. Pera, Daniel Ancheta, Keller & Kirkpatrick; Bruce Newrock, Timothy Brower, Rocco Cuozzo, Kupper Associates; Michael H. Marks, EIC Group, LLC. The rehabilitation of the former Thomas Maddock's Sons Pottery, most commonly known as the American Standard Building, this re-use "preserved one of the few surviving examples of potteries in the Trenton area" and "demonstrates the viability of early 20th century industrial buildings – often overlooked, for current uses." 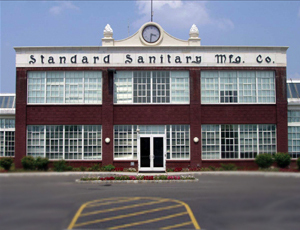 This was the largest and most modern sanitary pottery manufacturing plant erected near Trenton when it was constructed in 1925 by Thomas Maddock Sons Company. Qualifying for a federal investment tax credit, the total project cost was $92,500,000 and took less than three years to complete. It is now a 450,000 s/f three-building multi-tenanted office complex housing 12 businesses, situated on 112 acres adjacent to the Hamilton train station. The complex features a full service cafeteria, a fitness center, a conference center and ample parking. It is a stunning example of how a former industrial site can be transformed to modern day use, demonstrating how economic and environmental sustainability can be achieved through thoughtful historic preservation. Recognition went to: Kevin Blackney, Blackney Hayes Architects; Suzanna Barucco, Kise Straw & Kolodner, Inc.; Scott Ferguson, Sweetwater Construction Corp.; Michael O’Neill, Kevin Traynor, Jr., Preferred Real Estate Investments, Inc. This interesting project encompasses an innovative approach to neighborhood revitalization and has made an outstanding contribution to historic preservation. The Fairview Village in Camden was built in 1919 by the federal government as housing for shipbuilders, originally called "Yorkship Village", often cited as an example of successful town planning for workers in the World War I era. 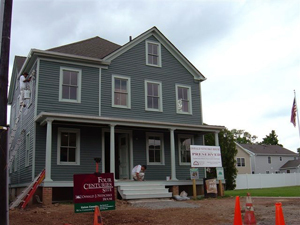 Funding came in part from the NJ Housing Mortgage Finance Agency, the Department of Community Affairs Balanced Housing funds and low-income housing tax credits. The project created 112 units of rental housing affordable to lower income New Jerseyans, spread between nine buildings. 82 of these units were renovations of historic buildings, spread over six original Fairview buildings. 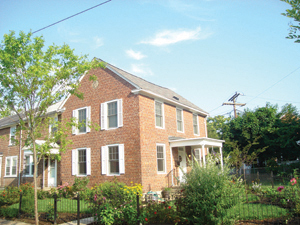 Over 90 historic single family homes were renovated and sold to first-time homebuyers. The project overcame several challenges of integrating modern systems and preserving historic details, such as needing to satisfy both mandated energy efficiency guidelines and historic standards for wood windows. Redevelopment of Fairview is truly a remarkable model that can and should be replicated throughout the state. To quote from the nomination: "The project has overcome a number of logistical and architectural challenges and managed to remain faithful to the historic details that make this neighborhood unique." During the construction of security improvements along West State Street, which consisted of sidewalk expansion, installation of security bollards, handicapped-accessibility ramps and utility work, foundations were unearthed during prescribed archaeological monitoring. Further exposure of these remains and limited testing confirmed the identification and approximate extent of the Offices of the State and Clerk of the Supreme Court. Coordination between key state agencies resulted in the implementation of a two-week program of emergency archaeological data recovery excavations while considering way in which project impacts might be minimized or avoided. Contractor operations were redirected to other parts of the project site to lessen delays in the construction schedule. Because of the public interest generated by this discovery, it was decided to commemorate the site by marking the foundation footprint in the West State Street sidewalk, directly over the original foundations. And the interpretive sign, summarizing the history and discovery, was unveiled this past week. 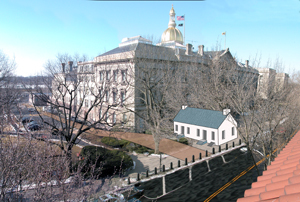 Although this project was nominated under the “project” category, the nominators wanted to make certain that we knew that it also merited consideration as an example of sensitive stewardship by state government for historic assets buried within and beneath the NJ State Capitol. For generations to come, visitors, including school children, who stand at the demarcation line will be struck by the realization that below their feet are the archaeological remains of a 212 year old structure. The interpretive sign will educate them about the human activity that took place there. This is exactly the kind of experience that encourages an appreciation for the past and a sense of history in the public mind. Recognition went to: Richard Hunter, Hunter Research, Inc.; Pasquale Papero, NJ Department of the Treasury, Division of Property Management and Construction; Kathleen Crotty, NJ Office of Legislative Services State Capitol Joint Management Commission; Karl Niederer, NJ Department of State, NJ State Archives; Karl Manger, Edwards and Kelcey Architectural Design Services, Inc.; Vern Knapp, Knapp Masonry; Anthony Barbieri, Designer Sign Systems; John Prajzner, Altchem Environmental Services, Inc. Given the threat to this house, the Society’s effort to, not only save, but to provide a realistic plan for its long term preservation and stewardship, is an effort worthy of recognition. 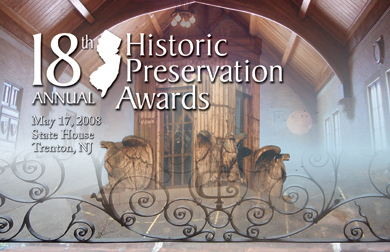 Recognition went to: Louis Gargiulo, William Valentinetti, L G H, Inc.; Shirley Maxwell, Sal Cirillo, Kenilworth Historical Society; Ross Sweetland, NJ Historic Trust; Margaret Hickey, Thomas Connolly, HJGA Consulting.